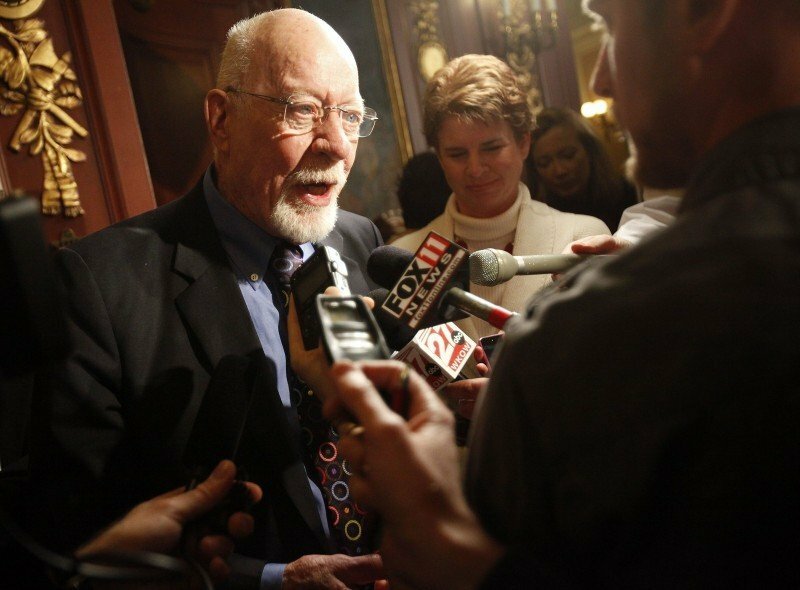 Sen. Fred Risser, D-Madison, said Friday that he was shocked by Walker's proposal. He said the governor seems to be "union-busting" and is coming across "more like a dictator and less like a leader." Joe Wineke, a former state labor negotiator and current candidate for Dane County executive, criticizes Gov. Scott Walker's budget repair bill Friday. Walker's proposal is expected to be taken up by the Legislature next week, and could pass as early as Thursday. Rick Badger, executive director of the AFSCME Council 40, called Gov. Scott Walker's budget plan "radical." Badger, whose organization represents about 33,000 local workers, said his members would not take the news in stride. Officials alerted the Wisconsin State Employees Union on Friday that expired collective bargaining agreements would be canceled March 13. State unions have been operating under the terms of their previous contracts, an arrangement that can be terminated with 30 days notice. The news came on the same day the governor unveiled a budget repair bill that would remove nearly all collective bargaining rights for nearly all public employees in the state and make it easier for employers to fire workers that engage in some form of labor unrest. To union leaders, and many Democratic lawmakers, the governor's moves represent an all-out effort to end the influence of organized labor in Wisconsin. WSEU executive director Marty Beil, whose union represents about 22,000 state employees, did not return calls Friday. But AFT-Wisconsin President Bryan Kennedy said Walker's move is part of a nationwide effort to kill labor unions. "It is a power grab, a coordinated effort to kill the union here," said Kennedy, whose organization represents 17,000 state employees. "This is essentially the governor saying, 'Sit down, shut up and do what you are told.'" Walker said Friday his proposals were necessary to help the state overcome the $137 million hole in the current budget, and eventually help the state make up the $3.6 billion shortfall projected for the next biennial budget. 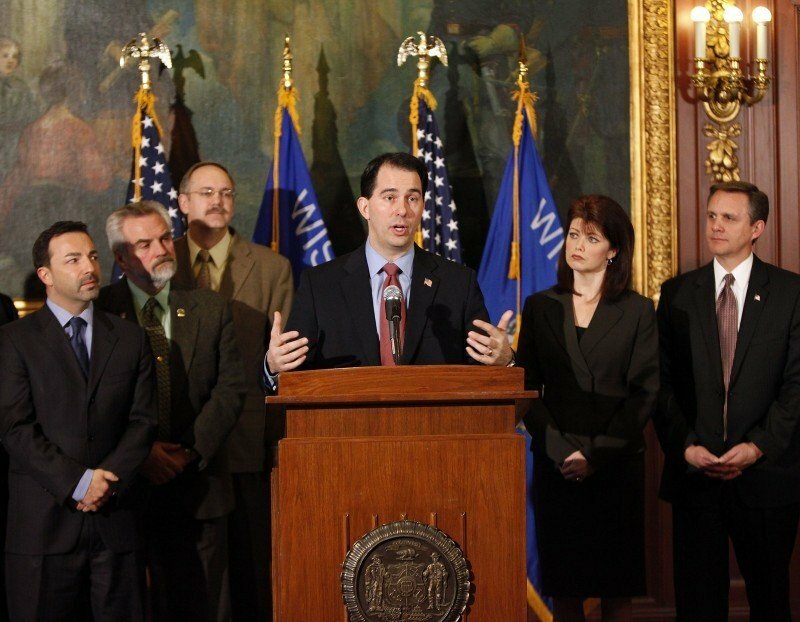 Perhaps the most controversial aspect of Walker's repair bill deals with collective bargaining. The governor wants to remove those rights for most of the 175,000 state and local employees in Wisconsin, allowing workers to negotiate only over salary. However, Walker exempted most law enforcement and firefighters from the change in collective bargaining. The governor said he could not risk public safety by potential strikes from law enforcement. But the governor said he was prepared, should other state workers strike in protest. Walker has already talked with the National Guard about possibly filling in with the Department of Corrections if employees there attempt a work stoppage. By ending state employees' ability to negotiate for their pensions and insurance rates, the governor will be able to increase employee pension contributions to 5.8 percent of salary and more than double their health insurance contributions. Currently most state employees pay nothing toward their pensions and only a modest amount for their insurance. Walker said those increases alone would save the state $30 million this fiscal year and ten times that much going forward. He also said the change would allow him to avoid employee furloughs and layoffs. Walker said he would likely have had to fire 1,500 people and cut about 200,000 children off Medicaid to make up the difference. He said those numbers get even worse going forward, perhaps costing more than 5,500 people their jobs in the next biennial budget. Sen. Fred Risser, D-Madison, was shocked by the proposal. He said the governor seems to be "union-busting." "State employees have the right to negotiate in good faith with the state. Without a willingness to even discuss what concessions need to be made with state employees, the governor comes across more like a dictator and less like a leader," Risser said. Risser said he hopes Walker will meet with union leaders, instead of unilaterally imposing these measures. But the governor said Friday that he did not have 15 months to negotiate these issues with the union, the amount of time it typically takes for the state and its unions to agree on contracts. Both Democratic and Republican lawmakers said Friday they expected Walker's bill will move quickly through the Legislature, perhaps being passed as early as next week. Republicans control the Assembly 60-38-1 and the Senate 19-14. Union leaders on Friday were not sure of their next move. Collective bargaining powers are conferred on state employees by the state Legislature and can be taken away. Paul Secunda, an associate professor at Marquette University Law School, said unions representing public workers could file lawsuits arguing their benefits were earned through past work, known as "vested benefits," and accuse the Walker administration of reneging on contractual agreements. "That legal challenge is going on in some other states where they've tried to cut back," he said. Secunda said unions may also argue there is a "constitutional right to collectively bargain," and that the government is interfering with those rights. Walker said he's consulted with attorneys and, while he expects unions to sue, he feels confident the state would prevail. "There's absolutely no grounds for it," Walker said of labor lawsuits. "As long as we're not terminating an existing contract, which we aren't." Contact Clay Barbour at cbarbour@madison.com or 608-262-6129; contact Mary Spicuzza at mspicuzza@madison.com or 608-252-6122. "I think at a minimum, we’re going to have a very inefficient collective bargaining process" — Dennis Dresang, UW-Madison professor emeritus of public affairs and political science. Outrage over a proposal to roll back benefits and collective bargaining rights of public employees has overshadowed an equally drastic Medicaid measure. It would be a wise decision to avoid driving in downtown Madison on Tuesday. Thousands of people were assembling Tuesday morning to march on the State Capitol in protest against Gov. Scott Walker's budget plan. A collection of key moments in the 2011 protests of Gov. Scott Walker's collective bargaining controversy.